Home > Team > Kate! 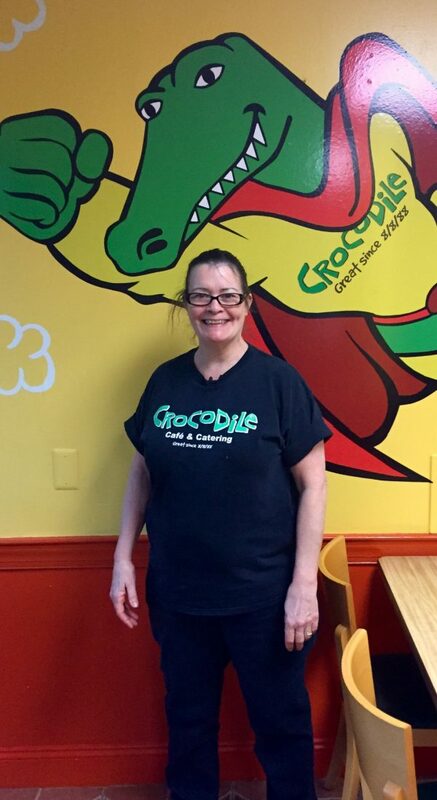 Kate has been at Crocodile for 19 months, and has played a vital role as a prep chef at Crocodile. (She’s the one who makes the Pedro’s pasta salad!) She loves her role because she knows she takes the pressure off the hot kitchen by doing what she does in our cold kitchen. Kate has never had a job in corporate catering, but has been in the industry for decades. She enjoys being a bit older than a lot of the Crocs, because the young guys and gals keep her young! Kate lives with her husband of over 30 years and has 2 children. She is an avid gardener and has a garden full of flowers and vegetables. Preserving foods and making her own grape and mint jellies are also things Kate enjoys. Kate loves to spend time outside, doing activities like hiking, fishing, and camping, in the many state parks Pennsylvania has to offer.